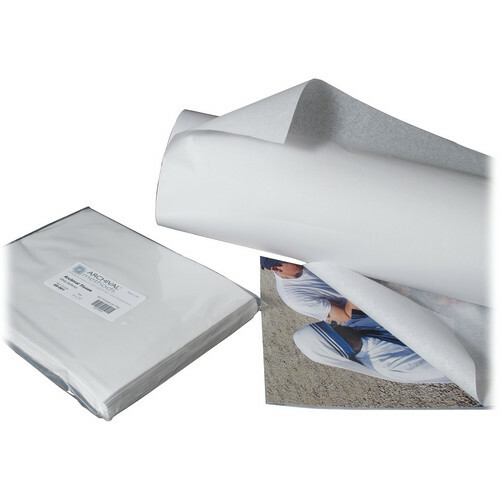 The 24" x 1000' Roll of Un-Buffered Archival Tissue Papers from Archival Methods is ideal for interleaving prints and drawings, preserving artifacts, and wrapping gowns, historic uniforms, and textile items. In addition, it is well-suited for protein based textiles such as silk, wool, and photographic prints made using dye transfer printing or cyanotype (blue prints). Made of high alpha cellulose pulp derived from purified wood fiber and 25% cotton, the tissues are free of acid and lignin, and do not degrade over time. Being thin, they can easily be folded, padded, or crumpled without the formation of hard edges. Box Dimensions (LxWxH) 24.5 x 6.4 x 5.6"